Cape View with its unsurpassed Pacific Ocean views is the ideal accommodation for those wanting to stay in the heart of Napier City. 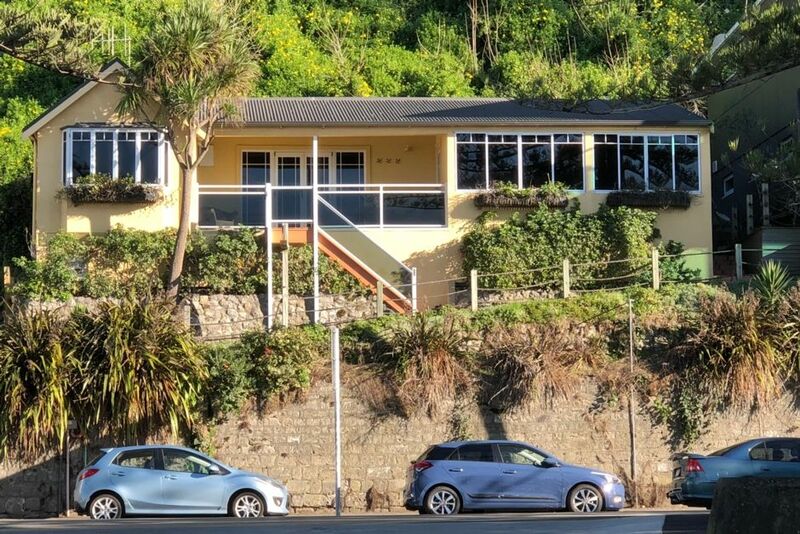 Perfectly positioned opposite the Ocean Spa Swimming Complex and only a few minutes walk along Napier's iconic Marine Parade to the City centre, its restaurants, cafes, shops and bars. Totally refurbished with two queen bedrooms, two bathrooms, open plan kitchen/dining room with bifold windows opening out to breathtaking views of the Pacific Ocean and Cape Kidnappers. A twenty minute drive will take you to Te Awanga where you can visit wineries, experience the thrill of a tractor ride to the Cape Kidnappers Gannet Colony or try your hand at golf at the Cape Kidnappers International Golf Course while taking in the panoramic views. Immerse yourself in the comfort that Cape View has to offer, soak up the ocean views and experience Hawkes Bay. It's an experience you'll want to repeat. There is no off-street parking but parking is unlimited outside the houses. Great location, lovely short walk along waterfront to all activities in town. Old house, well maintained and recently updated.Very comfortable. We found a spot right in front on the street, but parking could be a problem; and had to drag suitcases up narrow uphill walkway (that could use upgrading) and then up steep steps. Great front porch and sitting area! Whole house opens up to ocean breezes. Right opposite the beach and only 5 mins walk to town. Great views of the ocean. This is a dated property but clean and tidy inside, despite the musty smell. Spacious enough for 4 people with 2 bathrooms. Could be fantastic with a little attention. Only 1 bedside light so impossible to read in bed! Very noisy from the road outside on a hot day. Not really suitable for anyone infirm, has a steep slope and steps up to the property. There is free parking outside but full most of the day. Needed to car shuffle between the free car park and the road. Good kitchen with everything you need and the bonus of a laundry for a longer stay. Great location (steep access), stunning views. Lovely fresh clean linen. Hot in summer! This is ideal being close to the town centre - just a few minutes walk and opposite the beach but safer and better to swim in the pool complex which is very handy. Good value accommodation for four adults and pretty much most of what you need for a short stay. Handy free parking on the parade. Couple of points worth a mention 1) if you have any mobility issues, it is steep path and steps to the property 2) Being close to the town and on the parade has its advantages but if you are a light sleeper, you may have a problem early morning. Happy to recommend this property. Excellent communications with owner, thank you for our stay. This property is ideally located with great views and easy walking distance from the town and many attractions. Bluff Hill is the perfect place to stay to make the most of the water front. We loved the close proximity to town, and we were very happily surprised by the heating being on when we first arrived! Fantastic view of ocean spa, we had a lovely stay in the middle of winter, so we know this house would be awesome in summer!! The property was very neat and tidy, thank you.